Hellboy with an R-rating feels like a terrific idea. Looked at how revelling in gore, violence and F-bombs worked for Deadpool and Logan. Guillermo del Toro's versions of Hellboy were underrated gems that lived upto to the dark tone of the comic series it is based on, while toning down the violence and the swear words. With Toro now in his Oscar-winning phase, Neil Marshall looked like the right candidate to amp up the shock content of the film, if you know the director's body of work. They had a plan - a plan to perhaps make a franchise, or even an extended universe out of Hellboy. Did it work? Oh, Hell No! New Hellboy Trailer Goes from Hell Yeah to Hello No Pretty Quickly - Watch Video. Hellboy (David Harbour) is living among the humans, protecting them from supernatural threats on the orders of his adoptive father Trevor Bruttenholm (Ian McShane). A quest to capture three giants makes Hellboy face the reason for his existence, what with the revival of Nimue aka Blood Queen (Milla Jovovich), a fifth-century witch. 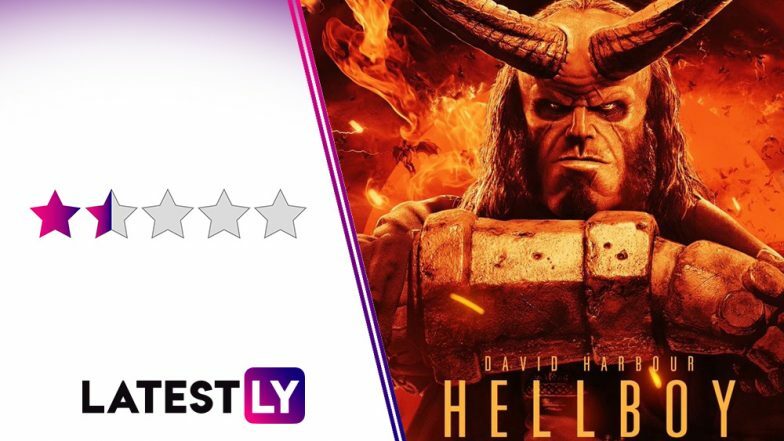 With an old friend Alice (Sasha Lane) and a combat operative with a dark secret, Ben Daimio (Daniel Dae Kim), Hellboy sets out to put an end to Blood Queen's bloody reign, while facing his own fears of becoming the monster he was destined to be. The first thought that came to my mind when I had a quick recap of Hellboy is that this is bloody bonkers. Frankly, my knowledge of this half-devil hero is restricted to Guillermo del Toro movies, therefore I am not sure how the storylines play out in the comics. But if the idea involved a mesh of King Arthur, undead witches, hog monsters, giants and a kid-eating hag named Baba Yaga, I really wanted to be a part of that discussion room where the writers discuss which oddity to thrown in the script. Perhaps, as a wink to Neil Marshall's work on Game of Thrones (he directed Blackwater and The Watchers on the Wall episodes), there is even a scene of Hellboy riding a dragon. The creature designs are really good and invoke the required disgust you expect from these abnormalities. That said, Hellboy is a bloody mess tonally, just the way the monsters make of the poor human beings in the film. At many places, the movie feels likes a cross between a homage to the original Hellboy movies and Resident Evil franchise, with a bit of Transformers: The Last Knight thrown in. Blame it on Deadpool, but the reboot also takes a page out of the Ryan Reynolds film to make irreverent, sometimes meta jokes, that at most, eke out a weak snigger from you. None of the influences, though, can basically hide the fact the Hellboy doesn't have anything new to say when it comes to its world-saving premise. Neil Marshall does bring his talent of grisly doings a la Dog Soldiers and The Descent into Hellboy. The movie makes full use of its R-rating with copious scenes of dismemberments, blood, gore and grotesquely body-bending monsters. And yet, the proceedings feel so one-note that none of these monstrosities makes you wake up from your slumber. That's the biggest problem with this new Hellboy - despite all the craziness happening on the screen, it feels so yawn!!! I can give the action scenes in the film as an example. There are three action sequences in the film that should have been really impressive to watch. But all these scenes are ruined some very over-active, snappy editing, marring the effect of the action. The only bits that induced interest in me was the hog monster (voiced by Stephen Graham) and Thomas Haden Church in a cameo as a Nazi killing vigilante. I will put all my money to watch a film made on the latter. At least, you can't blame David Harbour for trying hard to make Hellboy stand apart from Ron Perlman's take on the character. His scenes with Ian Mcshane feel like they have some soul, which the rest of the film lacks. Milla Jovovich is very okay. Hellboy: Milla Jovovich Talks About Playing Blood Queen in the 2019 Reboot. - The Rest of the film is a Bore! Even with its galore of hellish monsters and gore, Hellboy reboot is a freaking disappointment that fails to make good of the craziness it has in its premise. Avoid this one, and instead, maybe go for a rerun of the 2004 Hellboy series.